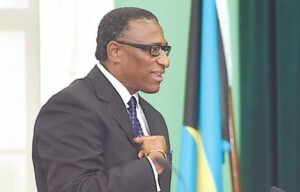 NASSAU - Bahamas minister of agriculture and marine resources Alfred Gray falsely claimed in the House of Assembly on Wednesday that his letter to Bahamas ambassador to China Paul Andy Gomez giving him authorization to develop further a proposed $2.1 billion joint venture initiative with the Chinese was not published in full by the press. But that statement by Gray was false. Gray’s full letter was in fact published in The Nassau Guardian on Wednesday, as the newspaper pointed out on Thursday under the headline “Gray tells a lie”. A day after he claimed The Guardian’s story on Tuesday revealing that Gomez was given authorization to further pursue the possible joint venture initiative with the Chinese was “utterly false”, Gray also acknowledged in the House that he did in fact give the ambassador permission to discuss the investment with investors. The matter exploded in Parliament after opposition MP Loretta Butler-Turner said the minister needed to provide answers. Rising on a point of order, Gray said, “Mr Speaker, the truth is this: I said in a statement that there was no proposal before the government of The Bahamas or this minister for any Chinese to enter into fishing in The Bahamas and that is true. “Mr Speaker, there could be no way that this minister or this government would give foreigners, whether Chinese, American, Dominican, no foreigners will ever get a licence to fish in The Bahamas. Full stop. And that’s part of what my letter said. “That’s why they don’t want to print the whole letter. If you print the letter, you would see the letter said that is a non-starter, don’t even bring it up, non-negotiable is the term I used. “Don’t even bring it up because it cannot happen. And Mr Speaker, the letter I wrote was to the Bahamian ambassador to China; I never spoke to any Chinese... The Bahamas ambassador presented me a few initiatives that he was considering and he was approached by investors and he wanted my permission to discuss those initiatives that he had for investment in The Bahamas, and we gave him the permission to discuss it. Gray’s letter to Gomez started on the front page of Wednesday’s Nassau Guardian and continued in full on page three. The letter summarizes ‘The Proposed China-Bahamas Agriculture and Fisheries Initiative’. Gray’s letter does say no foreigner will be allowed on fishing vessels, but it says they can own processing and packaging houses for agriculture and fishing products. The letter states: “Furthermore, and central to your discussions with representatives of the Chinese government, it is important to emphasize that it is the Bahamas government’s policy that no foreigner is allowed to physically fish in Bahamian waters by himself or in partnership with others, and therefore only Bahamians are allowed on the fishing vessels. This is non-negotiable, and your report should therefore reflect this policy position of the government. In the same letter, Gray gave Gomez approval “to initiate discussions with the Chinese Embassy here in The Bahamas, and with the relevant Chinese government agencies in China, in order to produce a comprehensive report on the viability of the proposed initiative”. The initiative would see China or its substantive representatives contributing to the 100 participating companies the $2.1 billion in cash (for working capital), agricultural and farming equipment as well as skilled expertise. If the proposal is approved, the Bahamas government would lease with an option to renew the lease for additional years, to all 100 companies, 10,000 acres of Crown land in Andros. Lease options would be available to each company for an additional 100 acres, provided certain clearly defined performance benchmarks are achieved. The Bahamas government would also grant to each of the companies fishing licenses consistent with existing Bahamian laws. When she addressed the matter in the House yesterday, Butler-Turner said “they need to explain to the Bahamian people what sort of deal they are doing with the Chinese”. She noted that Gray’s letter was in Wednesday’s paper. The Guardian’s story on Tuesday did not say any final agreement was reached.